As your business grows, we understand you may need to grow your team as well! Because of that, we’ve made it super simple to manage your team of photographers. You’ll be able to give them certain permissions or restrictions, depending on their role, as well as assign them to repeat customers or allow them to collect payments upon delivery. Giving your photographers this ability allows you to save time and focus on other parts of your business. *If you have any photographers working for you, please contact us so we can make sure Photographer Management has been enabled for your account. 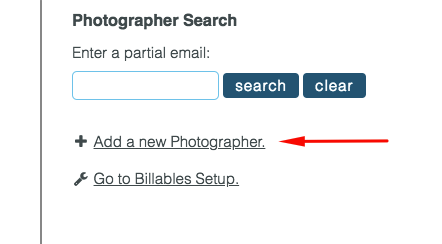 To add a photographer, go to My Account > Photographers, then click Add a new Photographer. Username - Just like any username, you’ll want to give them something unique to them. If that username has already been taken throughout the Tourbuzz system, you’ll receive an error message and will want to try something different (this can be something as little as adding a number to the end of your original choice). Password - Enter in a password for your photographer and let them know what their new login credentials are **new account information emails are not sent to the photographers. You’ll need to send a separate email to them letting them know this new information. Login enabled - This box should be checked in order to provide them access. Once unchecked, the photographer will no longer be able to log into the system. Can Edit All Tours - If this setting is unchecked, the photographer will only be able to make edits to the tours they are assigned to. If checked, the photographer will be able to edit all tours within your account, even re-assigning tours to different photographers. 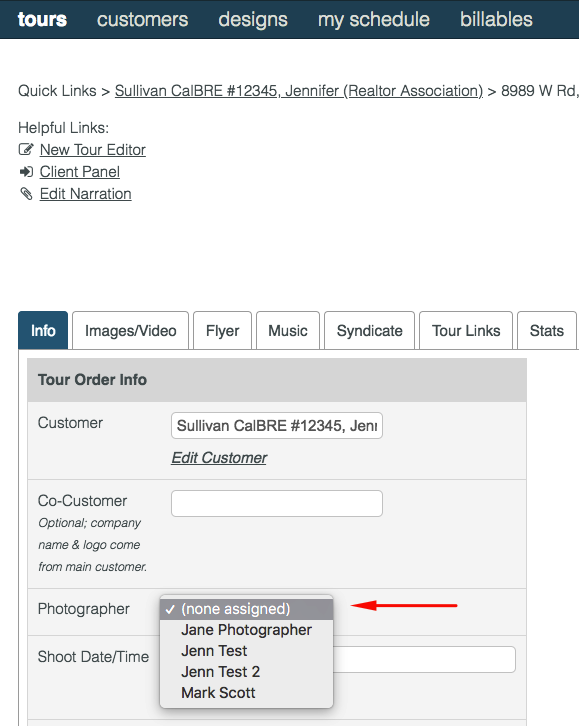 Do not allow tour publishing - Selecting this will allow your photographer to select a publish option, however, an email notification will be sent to you in order to complete the delivery. 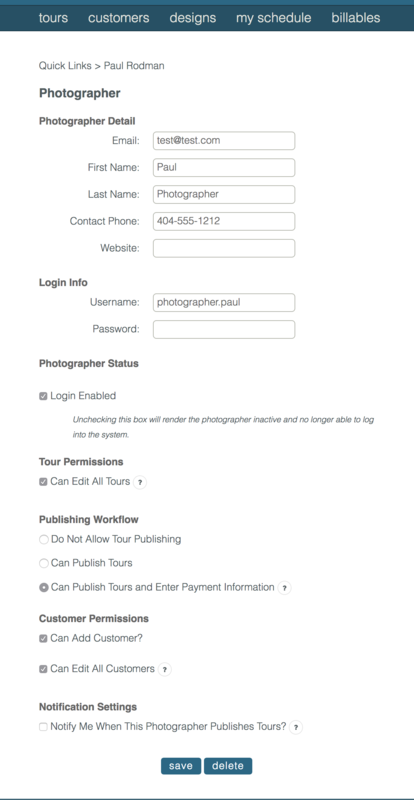 Can Publish Tours - This setting allows your photographer to publish tours. 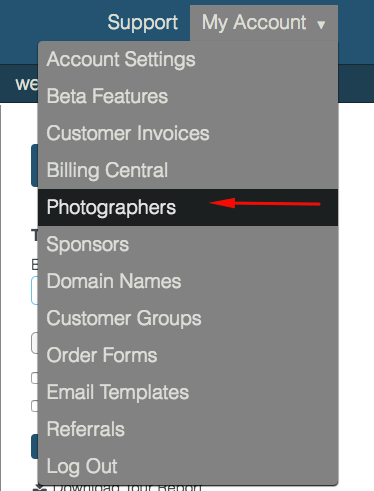 Can publish tours and enter payment information - This setting allows your photographer to publish a tour, and at the same time, gives them access to the payment collection options. They’ll be able to charge upon delivery, require payment from the customer before access, or just simply deliver the tour/images. They will also have the option to collect payment on any tour they are assigned to. Can Add Customer - The permission allows your photographer to add a new customer to your account. Can Edit All Customers - This permission allows the photographer to access and edit all customer records within your account. If you wish for them to not be able to edit customers, or only want them to see those customers assigned to them, you’ll want to select the permission above. Notify Me When This Photographer Publishes Tours? - If this setting is checked, you will be notified by email when your photographer: publishes a tour, collects payment on a tour, or sets a tour as awaiting payment. Once you've entered in all the information, click Create Photographer. You can always make edits to a photographer by going to My Account > Photographers, then clicking Edit to the right of their name. Make your changes and select Save. Go to Customers at the top of the page, then click Edit next to the customer. Click on the icon under Shoot Date. In addition to the shoot date/time/duration, you can also assign the photographer and Save. Once a photographer has been assigned to a tour, they will receive an Assignment email* containing the Tour Location, tour link, and customer contact information. They will be able to click on the tour link within the email to make any necessary changes to the Shoot Date/Time as well as mark it Confirmed. Once a shoot has been confirmed, an email* will be sent to the customer (co-customer if applicable) and their assistant(s) letting them know of the confirmed shoot date and time, as well as the photographer they will be working with. *You can make edits to both of these email templates by going to My Account > Email Templates. 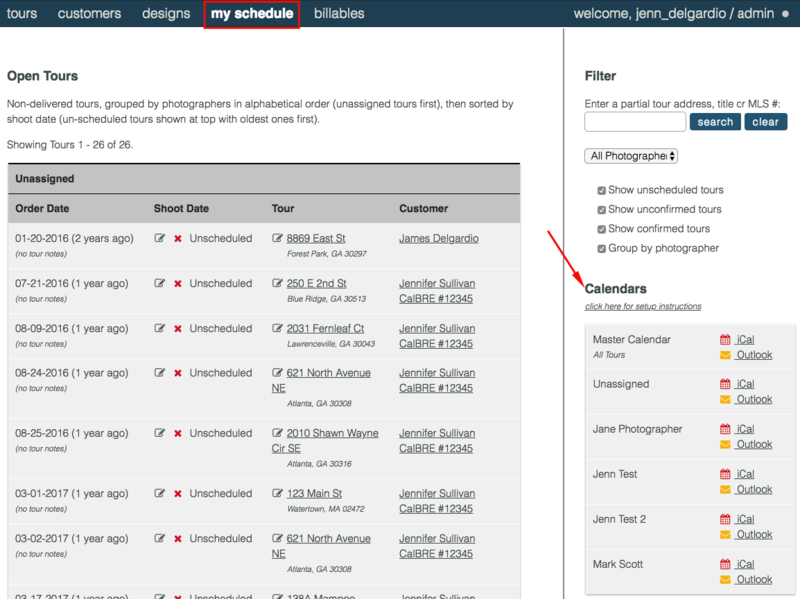 Just as you can keep track of your own schedule, you can also keep track of all of your photographers' schedules. To do this, go to My Schedule. This page will automatically show Unassigned tours at the top. On the right, you can choose from a few options to filter out exactly what you would like to view. You will have the ability to download each individual photographer's calendar, the Unassigned Calendar, OR you can download the Master Calendar which will show everything. To add any of the calendars to your personal calendar on your computer or mobile device follow the instructions for Macs, Windows, Androids, iPhones/iPads, or Google Calendar.